Utforska den gammaldags Bedouin-tullen, 1900-tals arkitekturen och de atmosfäriska basarerna i Dubai under denna 4-timmars kulturtemansturné. Resa genom staden med privat lyxbil, med en rundtur i Sheikh Saeed Al Maktoum-huset och en vandringstur i det historiska Bastakiya-kvarteret. Du har också tid att utforska Camel Museum, Horse Museum och Heritage Village innan du checkar ut Al Fahidi Fort. Den här kulturen i Dubai inkluderar en guide, privat bil och researrangörstransport. We would never recommend nor use this tour. Better screening needs to be done by the agency. top garage level loaded with pigeon waste, but was just as vulgar. the time and money. Saw very little of the culture and highlights. Perhaps the museum was best. We read the information ourselves. Guide presented little if any information. Dubai is checked off our list. Never to be visited. Curious to see if Viator would even post this review. Not a tour company I would use. This tour was great, excellent value for the money. It would be especially good for single travelers or those that don't want to negotiate their way around the old city. I ended up including a friend at the last minute and this was not a problem. Our guide Mounir was very knowledgeable, and flexible. He was great about dealing with the extreme heat outside by balancing activities inside and out. He gave as much or as little time in any given area. He also added on lunch at a traditional restaurant which was a great experience. Highly recommend this tour. This was a fantastic tour. Mounir picked me up at my hotel exactly on time. I didn't realize it was a private tour but I'm glad it was because Mounir let me change my itinerary as I pleased. He is extremely informative and I literally asked me over 50 different questions - from religion, equality of women to everyday life in Dubai. We pretty much explore all the areas listed on the site. I did however really wanted to try local food and Mounir was kind enough to take me to a place even though it wasn't on the itinerary! It was great! 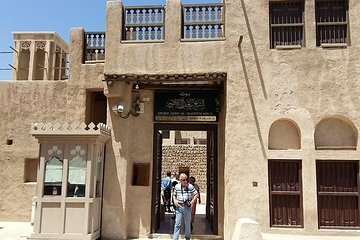 While I did to get to see the top highlights of Old Town, what I really value about this tour is the deep knowledge that Mounir has about Dubai culture and his ability to really impart that to me. If you are a historian or an avid traveler, this trip is well worth it.